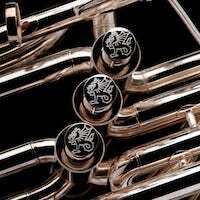 We are thrilled to introduce the new Wessex TB690 ‘Kaiser’ BBb tuba. Based on the design of the classic B&F tuba but with enhancements to improve both response and intonation, while maintaining the amazing classic German tone of the B&F. This must be tried to be believed! The prototype will be exhibited at Music Austria in October and then at the Midwest in the USA December. We thank Daniel Ridder of the Musikorps der Bundeswehr (Symphonic Concertband of the German Army) for his help with the development. We are also pleased to welcome Daniel Ridder as a Wessex Artist. Wow! I want one. Congratulations, Jonathan et al. Oh, wait------it's in BBb. Darn. I don't want to learn Bb bass clef fingerings. Ace wrote: Wow! I want one. Congratulations, Jonathan et al. Did you pick up tuba as an adult, or where your childhood experiences in the school band atypical?
' tuba looks good ! Looking forward to trying it! Will it be at TMEA in San Antonio in February? Doc wrote: Looking forward to trying it! Will it be at TMEA in San Antonio in February? The B&F (Bohland und Fuchs) is as legendary a tuba in Germany as the Chicago York CC is in the USA. It is the classic German sound and the tuba to which all other Kaiser BBb are compared. It was made famous by Walter Hilgers who I believe discovered one used by Hitler’s Guard band in Berlin and got Meinl-Weston to make the 197 copy. However it’s big problem (both the original B&F and 197) was its difficult intonation. Now through analysis of the bugle taper Chuck Nickles and Daniel Ridder have identified the cause of the intonation problems - and the resulting tuba is the new Wessex TB690. The Cerveny 601 may look similar, as I am sure it is based on the B&F design, but having previously owned one (actually the red brass version 701), I can say with knowledge that they sound very different. The B&F has a special sound which no other Kaiser that I have tried equals. I think it is somewhat down to bell profiles. For your interest below is picture showing the bell mandrel of the new TB690 Kaiser (right) beside the mandrel for the TC695 Chicago York. Surprisingly similar, but different. I think I want one of these puppies. Jonathan, the leadpipe is much shorter, but it looks like the valve section has been raised a bit to take this missing length up and add it to the main tuning slide (or at least part of that length seems to be in the MTS). Or am I going blind? Those things must weigh in excess of 250 pounds each. And they must have cost a lot of money to make out of the proper grade of steel. WOW! Very perceptive Wade! Yes we have shortened the leadpipe to improve response and to give a more useful length main tuning slide. However the valves were not moved. Another change not obvious from the front view is we have moved the 3rd and 4th tuning slides to the back to make for easy adjustment while playing. Thanks. I noted that the MTS is longer, so I assumed you simply kept it where it was and moved everything up a smidge. The horn looks great. I would love to test one in my orchestra. Do you have a price point figured out for this one yet? the elephant wrote: Those things must weigh in excess of 250 pounds each. And they must have cost a lot of money to make out of the proper grade of steel. WOW! A fork lift is required to move them around. I tried and could not move one. Even in China they cost tens of thousands $$$$$ to make! the elephant wrote: Do you have a price point figured out for this one yet? We are hoping to sell for about $9,500. The valve option will be a boon to those looking for that. It may boost sales of this, too. You never know. Will there be a fifth valve? Flip flops on the factory floor?? Mark wrote: Will there be a fifth valve? That will hopefully be an option. When we have multiple Kaiser available, then will experiment adding 5th valve and check if it has any adverse effect on the response. But general consensious seems to be that a 5th valve is not essential on a BBb.